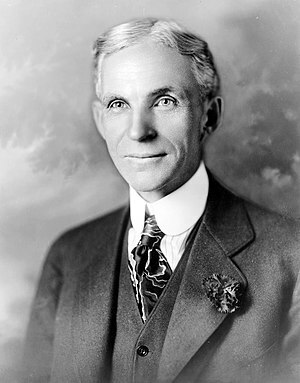 “History is Bunk” said Henry Ford. Or did he? Was this a considered statement of principle from the most successful industrialist of the 20th century? If so, it doesn’t bode well for those of us engaged in the business of business history. The source of the quotation was the third part of an interview by Charles H. Wheeler published in the Chicago Tribune on May 26, 1916. Pacifist Sees Submarines as Powerful Agency to Destroy All Armament. Henry Ford gave out his views on disarmament straight from the shoulder. There was another twinkle in his eye. “Say, what do I care about Napoleon?” he rambled on. “What do we care what they did 500 or 1,000 years ago? I don’t know whether Napoleon did or did not try to get across there and I don’t care. It means nothing to me. History is more or less bunk. It is tradition. We don’t want tradition. We want to live in the present and the only history that is worth a tinker’s dam is the history we make today. “That’s the trouble with the world. We’re living in books and history and tradition. We want to get away from that and take care of today. We’ve done too much looking back. What we want to do and do it quick is to make just history right now. He doubled up his fist and laid it on the table. The interview then goes on for another 2000 words without anything more on history and bunk. What’s clear is that Wheeler was doing his job – goading a reaction from Ford, a passionate pacifist. There was a strong anti-war movement in the USA then still bearing the scars of its own civil war. The quotation gained wider currency because it echoes so well with the development of his business: if history means being stuck in a time warp all we would need is a faster horse rather than an engine to replace the horse. It’s a large step away from this to disparage the value of lessons that history can offer in whatever context – family, business, people, international. Ford wasn’t condemning history per se – just the failure to learn from it. “The object of education is not to fill a man’s mind with facts; it is to teach him how to use his mind in thinking. And it often happens that a man can think better if he is not hampered by the knowledge of the past” he wrote in his autobiography, shortly before his infamous and odious anti-Semitic diatribe. Ford’s anti-semitism and his influence over Hitler are explored in detail in this Spartacus piece. Ford was very keen to ensure his own place in history by preserving his own writings and avidly collecting historical objects which are now displayed in one of the largest museums in the world. Named after him, of course, and bunk nowhere to be seen. Footnote: Charles Wheeler had a celebrated namesake, one of the greatest BBC correspondents of his generation.